Presciently, Žižek, unknown to most audiences, summarized the potential and the problem of the Occupy Wall Street movement. In September of 2011, a protest started in lower Manhattan asserting that that 99 percent was taking it on the chin from the nation’s top 1 percent. Without much, or sometimes anything, in the way of specifics regarding what the protesters were demanding, the assortment of protesters took over Zuccotti Park in Lower Manhattan as “Occupy Wall Street,” and within mere political moments was replicated by similar encampments in cities all over the nation and throughout the world. Although right-wing critics imagined that the Occupy protesters were being pulled and pushed by offstage puppeteers named Soros and Obama, nothing of the sort really happened. It was spontaneous and chaotic—ruled by uproarious democratic assemblies, with Occupy tents and drum circles coexisting with suburban commuters on their way to downtown office jobs, only to fade away eventually under the pressure of municipal authorities tiring of months’-long encampments in public spaces and the gradual anomie of the Occupiers themselves. This month, there were commemorations of Occupy in New York City and in a variety of other cities around the nation. New York City’s was a little desultory; not a big turnout, but like the large numbers of protesters who showed up two years ago, the meaning of Occupy isn’t in the numbers. After two years, there is something to be said about what Occupy accomplished and where the movement, if it still exists, might go—and what activists might learn from the process. “It changed the whole debate”: Interviewed at the commemoration, journalist Chris Hedges, describing Occupy as a “seminal moment in modern American history,” put his finger on an important accomplishment of the protests. Two years afterward, the excesses of the top 1 percent are an issue of concern throughout U.S. society and the world. 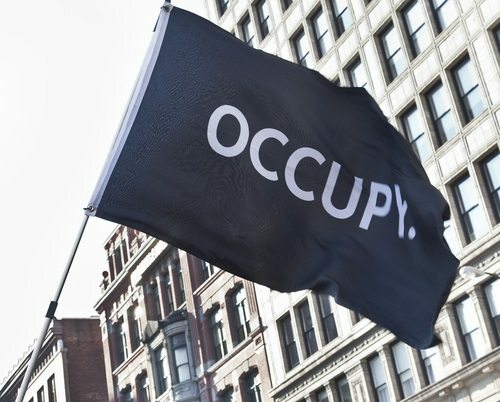 Occupy didn’t invent the “1 percent vs. 99 percent” issue; it was brought into public debate in a major way several months before Zuccotti Park by Nobel Prize–winning economist Joseph Stiglitz, but the Occupy movement translated the concept into an on-the-ground framework for societal grievances. As a result, politicians, such as New York’s governor Andrew Cuomo, who had been prepared to lighten up on taxes for the top 1 percent, backtracked in part because Occupy helped provide a lens for organizing and protest. “We’re still here, still fighting, still strong,” pronounced one Sumumba Sobukwe at the two-year commemoration, but it may be less a matter of protesters keeping up the “fight” than the message they articulated still possessing resonance with politicians, who may think twice on some occasions when they would otherwise, like Governor Cuomo, have simply given benefits to an income class that didn’t need them. It fell short of making progress: In New York and elsewhere, there was resistance from the encamped protesters against turning the framework into a more concrete set of policy demands aimed at Wall Street or, more broadly, at corporate America. If they could have translated their energies into a coherent agenda, the Occupiers might have been able to rally non-Occupy support for actions that might have articulated, symbolically and concretely, what ought to be done to rein in Wall Street. For example, it was a perfect time for organizing around a financial transactions tax—the so-called “Robin Hood tax”—that a broad range of experts, including Jeffrey Sachs, Bill Gates, Sen. Tom Harkin, retired Vanguard CEO John Bogle, Paul Volcker, Paul Krugman, and Stiglitz supported, but then–Treasury Secretary Tim Geithner, speaking on behalf of the Obama administration, inexplicably opposed in the U.S. and internationally. It might have been able to put some energy behind bringing some of the Wall Street crooks responsible for the 2007-2008 collapse of the economy to justice, something that the Obama administration through Attorney General Eric Holder has resisted. It might have taken advantage of Harvard University law professor Lawrence Lessig’s offer to OWS to galvanize around campaign finance reform aimed at reducing or eliminating the power of the 1 percent to dominate the 99 percent. None of that happened, because there was an odd commitment of the Occupiers to not galvanize around an agenda. It was a little taken with form over substance: Or, in Žižek’s thinking, the Occupiers fell in love with themselves, the romance of being protesters taking on the state. But a movement thinks outward, not inward. In speaking about the 99 percent, many Occupiers failed to see how out of touch they were with people who comprised the 99 percent. Whether it was Zuccotti Park in New York City or McPherson Square in Washington, D.C., the prolonged encampments deprived not Wall Street executives, but everyday working people of public spaces. The incessant drumming hardly penetrated the enclosures of the 1 percent, but discomfited the working people who were neighbors of the encampments. It’s not clear whether Hedges is right that the New York City police were dropping off people released from Rikers Island at Zuccotti Park to further mess up things, but he is right that a lot of the energy of the activists on site was spent on dealing with problems of people using drugs and committing crimes, including sexual abuse, rather than organizing. Assembling and protesting is a right to be protected, but occupying and depriving ordinary Americans in the 99 percent of clean and safe access to public spaces is a bad tactic. Little Occupy outgrowths with positive impacts: Too many of the Occupy denizens who camped out until finally cleared out were romantics who envisioned themselves as modern-day Peter Kropotkins and Emma Goldmans. They weren’t much like them, but there were people in the Occupy movement who did want to do accomplish something positive and constructive. People motivated by their experience in the Occupy movement have turned out in local areas to be effective local organizers against housing foreclosures, for alternative banking, and, embarrassingly to some mainstream nonprofits, organizing around disaster relief, particularly concerning the response to the residents of Far Rockaway in Queens in the wake of Superstorm Sandy. The Occupy Wall Street dynamics were such that every decision required near-consensus and anyone, regardless of their connection to the Occupiers, could be legitimized as speakers and decision makers. The OWS “assemblies” were virtually designed not to work. But the experiences of some who came together under the banner of Occupy Wall Street had them come away with a perception of the possibilities of organized action. The challenges remain. As noted in Investment News, the divide between the top 1 percent and the rest of us is the greatest it has been since 1927—the top 1 percent taking in 19.3 percent of household income in 2012, compared to 18.7 percent in 1927. Occupy might have mucked up that analysis somewhat by suggesting that the income disparities among the remaining 99 percent weren’t all that consequential, when they truly are huge. As President Obama’s suggested tax reforms have implied, it’s not just the 1 percent, but a larger swath of the top of the economic pyramid that should be paying more into the national fisc to help those at the bottom. The nation’s actual poverty rate hasn’t budged in years, still capturing 15 percent of the population; real unemployment remains extraordinarily high in light of the shrinking labor force and the increasing dominance of low-wage, part-time jobs; and somehow the minimum wage remains stuck at a level below anyone’s concept of a living wage. Those aren’t just issues around the top 1 percent, but concerns for the population left behind by much of America. Moreover, any set of pictures of Occupiers will also show that it was a largely white movement that bypassed issues of race, despite the attempts of some of the protesters to link their activities to the traditions of Martin Luther King, Jr. and Malcolm X. Despite strained efforts to present an image to the contrary, the movement never truly connected with the black population of the U.S., which suffers from poverty and unemployment at much higher rates than whites. While there was a revolutionary, anarchist “carnival” feeling to some of the Occupy protests, Occupy Wall Street did galvanize the vocabulary of social and economic inequality in the U.S. During the 2012 presidential campaign, even President Obama referenced Occupy by name and addressed the concerns that the protesters were raising, even while he took campaign contributions from Wall Street and failed to take action against Wall Street crooks. Occupy did lead to local efforts such as Occupy Our Homes that have provided another voice in some communities against bank foreclosures. And maybe there is something that can be recovered from the Occupy movement. As CNN noted, a group has formed to organize support for the Financial Transactions Tax. The “Robin Hood Tax” group meets regularly—in Zuccotti Park.